Visual Terrain joined the Beyond All Boundaries project team in 2006 as the show lighting designer. Our role in the project and the overall 4D process was to further immerse the guests into the Beyond All Boundaries story with the lighting. Key to designing lighting to match an experiential attraction, like Beyond All Boundaries, is the understanding of the color range and palette of the other design disciplines and then clarifying when and how lighting can help to accentuate the strengths of the other design elements or to bridge the distance between projected and non projected scenery. Because of the pre-production schedule for the media, and the needs of construction schedule in the space, a lighting scheme needed to remain flexible until the last possible moment allowing for unexpected opportunities that arise when all members of the creative team are in the building assembling the show. Entering the Victory Theatre, you see a red curtain at the stage and what appears to be traditional seating throughout. Soon it is revealed, that this is not an ordinary theatre experience. Guests at some moments will be both passive viewers as the story unfolds and at other moments they will be fully immersed into the action with moments on screen that are supplemented with lighting effects directly overhead and all around the guests as they view the show. It was our job t make these effects support the overall story and mood and to orchestrate them carefully to never upstage the overall experience. Like all lighting designs, when you challenge yourself beyond your comfort zone, there is a leap of faith. We feed on trying something new, pushing the envelope to create something different. In Beyond All Boundaries, some lighting effects called upon our usual bag of theatrical tricks, while others were brand new to us. Some effects were instant successes; some took some work to achieve. No amount of testing ever made us secure that the giant bomb effect would adequately stun and amaze an audience. But, the reality is that the large-scale strobe we chose created the right moment. We worked hard to integrate the lighting within the set pieces – as in the design and creation of a custom guard tower light that echoes the searchlights used on the actual towers. We also used a variety of lighting within the multi-layered screens and sets to reinforce the more dimensional approach to the overall experience, which helps to draw the audience in even further. For instance, in the dog-fight scene, we are careful to move the lighting across the audience in a way that mimics the fight on-screen. During the heat of the jungle scenes, we are careful to reinforce the feeling of the heat beating down on the soldiers day after day and during the snow falling scene we use the lighting to highlight the actual snow falling on the audience as well as to light the audience in cool blues. 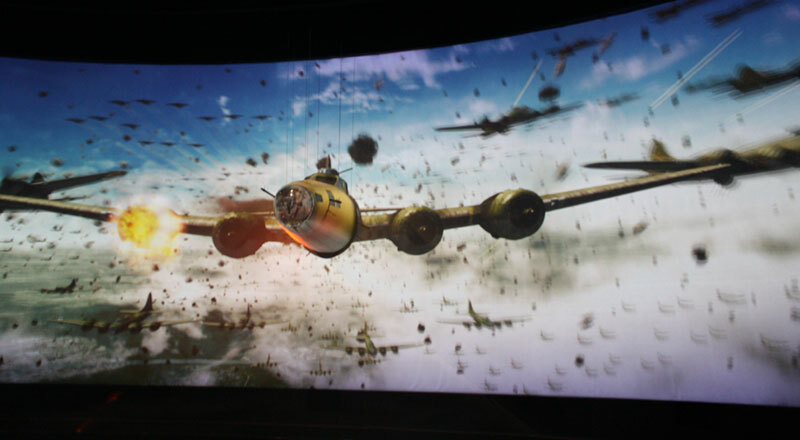 This show was a personal project for many members for our team as we all have relatives who participated in the war – whether they were our mothers, fathers, grandfathers, uncles or aunts – we have all been personally touched by re-connecting to our own families experiences as an extension of the project. Lastly, Principal Designer, Lisa Passamonte Green stated “Visual Terrain is proud of our participation on the project and truly enjoyed the collaborative process of working with the talented team The Hettema Group assembled”.